Last October at the Blue Horizon, a new Victor Vasquez emerged in his fight with Tyric Robinson. It was a more controlled and stylish Victor Vasquez. He didn't get cut or bruised. He didn't make it hard for himself by giving the blood-thirsty crowd what they came for. He just handled Robinson with more boxing skill than he usually shows and, dare I say, coasted to a near shutout victory. It was exciting to see this young North Philly fighter rise to a new level and wonder about his future. What would be next for this changed man? Hours and hours of tattoo removal? 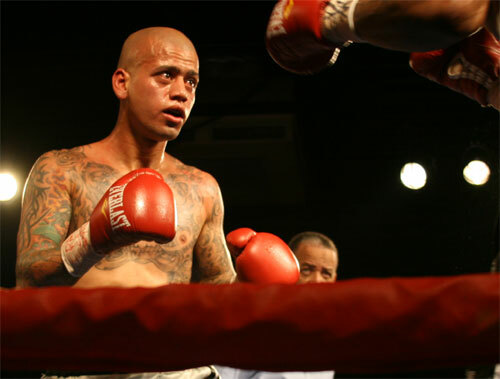 On Friday night at the South Philly Arena, Vasquez had the main event. And the Victor Vasquez that fought on this night, was not the same guy from last October. About half-way through the first round it was clear that the original Victor Vasquez was back. And in about that length of time - 90 seconds - I realized how much I had missed this one. His six-rounder against Philly southpaw Gustavo Dailey unfolded into a brisk and messy brawl right from the get-go. Dailey took the first two rounds and even wobbled Victor mid-way through round two. Vasquez fought the rest of the round with a look on his face that was either one of extreme focus or extremely concern. When a fighter begins to develop a new style - or evolve his style into something new - it helps early on if his opponents don't give him too much to think about. Boxers are creatures of habit. When the chips are down, their fighting instincts usually trump any new methods or tricks learned in the gym. Back in October, Tyric Robinson played along with Victor's new style. The truth is Robinson was too busy dealing with his own decline to put up much of a fight with Vasquez. So Victor didn't revert to his usual reckless, grinding style. But against Dailey, those early shots he took clicked his brawler switch to the "ON" position. Roaring back came the Victor Vasquez that has the ability to leave us breathless and make us shake our heads simultaneously. The old Victor was back, and the crowd was loving it. Vasquez picked up in the third and strung together some winning rounds to take the lead in the fight. But it wasn't easy. Dailey kept catching him and at times pressed him to the ropes. But Victor fought back and kept control of the close-quarters brawl. In the fifth round, Vasquez sliced Dailey over the right eye. Later, the laces on Dailey's protective cup broke inside his trunks. For a good part of the round, the cup hung, and spun and seemed to widen. All of this action took place without referee Hurley McCall noticing. Luckily there were no low blows. Finally, when Dailey's trunks looked more like an inflatable vest, the referee took note of the problem. But it was the end of the round by then. Dailey's corner jumped right on the issue. When they couldn't re-tie the laces of the troubled cup, they simply tightened it with a fashioned belt of adhesive tape. The repair job took the entire one-minute rest period, and Dailey's bloody eye wasn't so much as wiped before the sixth and final round. During the last three minutes, Dailey kept up the pressure. But Vasquez had the answers. 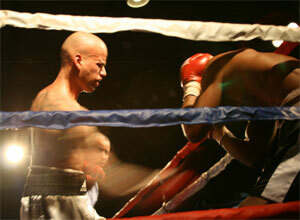 He successfully landed his right uppercut as the round hit the half-way mark. He used the punch twice times very effectively. The first one wobbled Dailey. The second staggered him, and the barrage that followed forced Dailey into a corner and sapped his strength. Fittingly, another big right uppercut was the final punch that landed, and it forced Referee McCall to stop the bout at 2:05 of the last round. Vasquez, 133 pounds, improved his record to 11-3 (6 KO) with the win. Dailey, 133.5 pounds, fell to 4-9 (1 KO). It was the fourth time he was stopped. Germantown's Coy Evans won quickly and impressively against his journeyman opponent from England, in another scheduled six rounder. 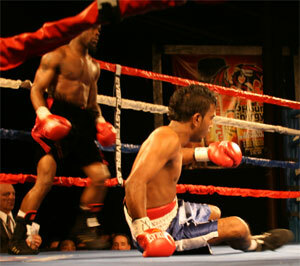 Vineash Rungea entered the ring with a lumpy 2-14-3 record, and left less than two rounds later. But he came directly to the flashy Evans, even winning the first round on this scorecard. Although Coy landed the best shot of the round - a hard right hand, Rungea pressed Evans to the ropes and kept him there for a good portion of the round. But Evans didn't seem worried. Maybe it was just his opponent's southpaw style that presented a momentary puzzle. Evans came out blazing in round two and dropped Rungea twice. Each time, a quick, straight, hard right was the weapon. Rungea managed to land a sneaky shot between his trips to the canvas, but Evans was in finishing mode and hardly even noticed. The end came at 2:19 of round two. The win made Evans 6-0-1, and was his very first KO. Both fighters weighed 128 pounds. Anthony Ferrante, Northeast Philly, struggled in his six-rounder against the more experienced Andre Hemphill of West Philly. Hemphill is unpredictable these days. Sometimes he looks like he's got something left, other times he appears to be there just for the payday. On this night, he came to fight and to challenge the popular young Ferrante. He did a pretty good job. 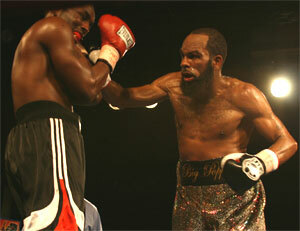 Hemphill opened the fight by forcing Tony to the ropes and letting go a hard - and loud - body attack. "SMACK, SMACK, SMACK, SMACK." Moments later, he wobbled Ferrante with a right to the head. Andre looked to be in good shape and seemed like a hungry old pro out to surprise a youngster. But Ferrante got his game together starting in the second round. He used his superior skills and his undefeated mentality to tough out the troublesome Hemphill. Although just half a pound in weight separated these two (Ferrante's 175.5 to Andre's 176), it looked like Hemphill could have ten pounds on Ferrante. Hemphill worked hard, but Ferrante slowly and slightly gained the edge. The fourth round was extremely close, and very difficult to score. Ferrante had his best round in the fifth, when he took complete control as Andre tired. 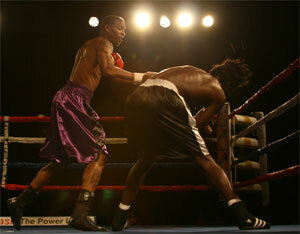 But Hemphill rallied well and won the sixth and final round. 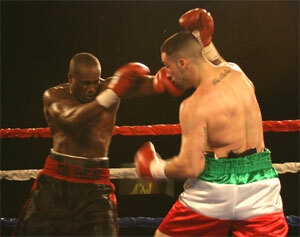 On my card, Ferrante won the fight four rounds to two (58-56). However, the official judges turned in a split verdict. Lynn Carter scored 58-56 for Hemphill; Richard Hopkins had it 58-56 for Ferrante; and Pierre Benoist scored it a rather wide 59-55 for Ferrante. The win improved Ferrante's record to 9-0 (4 KO), but he was nicked and bruised throughout the fight, and also suffered a minor cut in his hairline. These marks may endanger his already scheduled tenth start slated for February 26. So we'll have to see about that. But this was a tough fight that probably did Ferrante some good in the development department. Young guys need tough fights. But at this point in his career (8-14-2 / 5 KO), Andre Hemphill needs some easier ones. Tommie Speller continued his comeback after a two-year layoff for the treatment of cancer. He came away with a win this time, but did not look great doing it. Tough, yes. But not great. The West Philadelphian took a lot of punishment in his phone-booth bout with Dave Cook of Butler, PA. Both landed well in the first round - Speller early and Cook late. Both fighters bled from the mouth in the second as their brawl continued. But it seemed to me that Cook was the stronger and more aggressive fighter. He was pushing the fight and dishing out the pain. But it was a grinding type of contest, with both having their moments. In the third, Cook smashed Tommie with a left hook that had the spit flying. Near the end of the round, Cook cut Speller's eye with a hard right. That eye looked like it was going to open ever since the first. I guess it held on as long as it could, but finally gave in. But the rest of Speller kept fighting hard. He took the fourth and final round on my card. It was the only one I gave him. But the judges saw it the other way. All three of them (Robert Grasso, Richard Hopkins & Pierre Benoist) gave it to Tommie 39-37, or three rounds to one. Speller, who weighed 164, moves on with a 5-3 (3 KO) record. Cook, 164.5, went below .500 to 3-4 (2 KO). 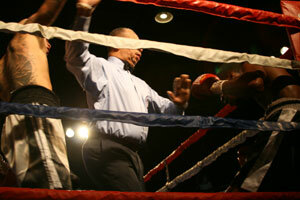 The show opened with another win for Glassboro, NJ southpaw Derrick Webster. He did his part in the fight, but the same can not be said for the guy he was in against. Antonio Walls, Washington DC, was not in a fighting mood and opted to stay on his stool after the second round. He took a few good shots in the round two, but everyone was surprised - and annoyed - that he chose not to continue fighting. Webster, 159.5 pounds, raised to 4-0 with 3 KOs. The 6'4" fighter came in under the middleweight limit for the first time in his young career. He's been compared physically to Thomas Hearns. Time will tell if he can fight like the Motor City Cobra. Walls weighed 158 and dropped to 2-3 with 1 KO. Derek Ennis was to have topped this Power Productions show, but a twisted ankle forced him to postpone his bout with Edwin Vasquez. Now they will fight at the Blue Horizon on February 5th. Also scheduled to fight at the South Philly Arena were cruiserweights Charles Hayward and Zeferino Albino. However their bout was scratched just before fight time. This was the first fight card of 2010.